The shelter passed along to us from the former owners that Viva loved long walks. They probably meant measured in time, not in distance. Viva hardly ever stepped up in pace, let alone take a run. As we soon where to find out, every step was painful for her. Caused by spondylosis and a continuously infected paw. She already lost a lot of muscle with this inactive lifestyle, and she was in a negative downwards spiral. 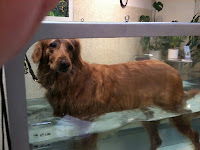 After we cured the infected paw and managed the spondylosis, we guessed it would be easy to build up some muscle again. We were looking forward to getting started. We could not have been more ignorant. What's wrong with a couch-potato? ﻿﻿﻿﻿﻿﻿﻿Viva was in better health and pain free, but the mind still told her to spare her legs and back. We could notice her being more happy and playful, but the walks were like before. The first thing she had to learn was that it was alright to use her legs again. We adjusted our walks and made sure to do a lot of uphill walking and swimming. Preferably on the beach, plowing through sand and dunes. Building up muscle is hard work. For Viva, but even more so for us. We came home exhausted from our work-out walks - which are more like runs to us humble humans. But that is by far not good enough for a dog. Therefore we tried bicycling, but that was just to stressful for her as a fearful dog. We also tried with toys, luring her into going uphill or climbing a sand dune. But Viva is not that easy to lure. Once up on a hill, she didn't come down anymore and enjoyed her toy by herself. Or find out a less steep slope to reach the toy. Throwing another, more valued toy, didn't help getting her down either. Walking away would get her down though. But we had to find a new hill to throw the toy. Throwing it up the same hill again, she would only look at me and think "You must be stupid ...". When I asked Kenzo's help to get the toy back he was happy to oblige. But Viva thought it was very annoying he was getting "her" toy and waited for his return downhill with an attitude. Not a good idea if we wanted to keep the peace. I had to climb up and get it myself. In the end, it was me getting the exercise instead of Viva. The water walker was absolutely key to make any substantial progress. 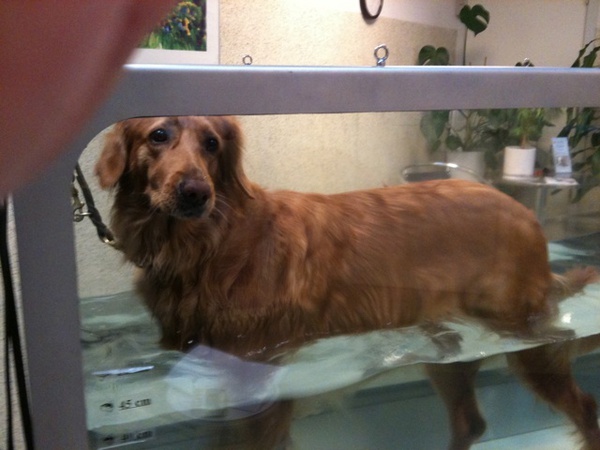 Walking this underwater treadmill once or twice a week forced her to use her legs. It was also a great way to follow her progress. Not only could we increase the time for each couple of sessions, we also could get a good picture of what she could cope and put a time on it. As soon as her steps became smaller, we knew she had reached her threshold. We found the water walker to be a great and absolutely necessary addition to our daily work-out schedule. Viva started with a five minute session. Then we slowly build this up into multiple short sessions with a break in between. Today she can do a 13 minute non-stop session without getting tired. Pretty good Viva! To compare, a healthy dog could do a 30 minute session. But I am not sure if that would be realistic for Viva because that would certainly be too stressful for her back. Slowly, very slowly, we can see her make progress. 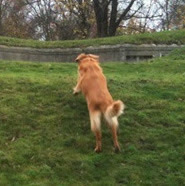 The biggest progress we saw was when her mind made the switch that it is cool to use both of her hind legs. 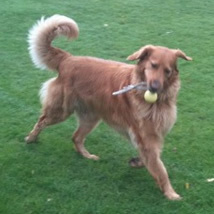 Her gait improved into a more dog-like style, instead of using her hind legs as bouncers. She could accelerate and stop quicker. You could see her really stretch her legs to make big steps, meaning she was using her muscles. To keep a good track of her progress we made a simple diary with videos and pictures of Viva doing the same things on the same places. That way we could track difference better. See this video here comparing Viva walking up stairs after one month of training. The two pictures above to the left and right also shows how she is able to stretch her legs now. Because progress is so slow on a daily basis, the diary helps us to notice improvements being able to compare over a longer time. It is a mood booster too, that keeps us going. There should be absolute balance between her medical treatment AND the work-out. We learned it the hard way. We have some NSAID's around might we miss an acupuncture treatment and I will not hesitate to use it next time. Ha! you make it sound like you can keep up with me ... not! The question I struggle with now is how far I can take this. Viva will never become as agile as she once was, and I must take care not to overdo it. I am very happy with where she is now. She can do a one hour "work-out walk" with no signs of stiffness or pain the next day and fresh for a new work-out. The way she positions her legs, turned inside to better support her body, has improved a lot but could be better. When she can position them straight it will be a great indication that her muscles are strong enough. So we continue with the work-out and the water walker. Just taking it slowly, and giving Viva a chance to show how far we can take this. A big thank you to the awesome people of the vet clinic "Københavns dyrehospital" and the love they have given to Viva: Lea, our water walker trainer and coach, and Charlotte, a great vet with a magic pair of hands. Animal welfare for pets varies enormously throughout Europe. Not only do countries legislate differently. Even towns legislate differently. Last week's story on Dancing Dog Blog about the Swiss town threatening to put down dogs for unpaid taxes was yet another example. Thankfully the Swiss government quickly stopped the local authorities before any dog could get hurt. A painful reminder of the incoherent policies throughout Europe. Seen in this light, there was positive news last November that this is about to change. The EU announced that the protection of companion animals - meaning dogs and cats - will be integrated in EU animal welfare legislation. See the press release her: Good news from Brussels: Dogs and cats under protection of the EU. When the EU legislates, it overulles all other country and community laws. In one blow they are able to harmonise all legislation about animal welfare. All will benefit. Even countries like Germany and the Netherlands that already have the above in place, suffer from puppy mills in Eastern European countries that keep the illegal influx of puppies alive. Germany is an excellent example of what can be accomplished by the plan. Their efforts have resulted in only 8% of the population owning a dog. As far as I know, Germany is no-kill already. Compare that to France with a much softer legislation where 38% of the population has a dog. Great-Britain with 23% and 15,000 healthy dogs killed each year. The southern and eastern countries have even more issues. Strays, puppy mills, etc. So many lives can be saved. It would be great if we could follow the German and Dutch scenario all over Europe without local exceptions. Can the EU make a difference? The goals are ambitious and sound like music to my ears. As wonderful this news might seem, I have mixed feelings about it. The EU is definitely the place that could make a change, unfortunately it is also the Mecca of bureaucracy and compromise. The track record of the EU in the area of animal welfare is very poor. So far they have only focused on life-stock and progress in this area is futile, hindered by big fat agricultural lobby groups. I hope the EU can break with its own past and accomplish their goals. This is their chance. No, this is our chance. The pet industry, puppy mills in particular, have no EU lobby power like agriculture. Neither is it likely they have the financial means to build up an EU sized lobby. On the other hand we have also seen the whole of Europe making the wrong decisions in animal welfare due to some farmers going to the barricades in just one of the member states. Fair enough. I am excited, this gives hope nonetheless. The action plan has just been set in place, and therefore nothing concrete has come out of Brussels yet. But some first steps already are visible. At the moment they are building websites to inform the public and gathering data to develop the policies. Everything will be published online. Keep your eyes on this unfolding website: http://www.carodog.eu/. Data from all European countries and from most other countries in the world will be collected here, with numbers and performance indicators about companion animal welfare. How many dogs are sheltered, how many re-homed, put down etc. Together with showcases of successful projects, the tools to analyze it, and what was done to reach those numbers. Compared per country. Bookmark this site, it will become a rich source of information. We all worry about our dog's health. What about Hovawarts? What conditions do they fight with as a breed? 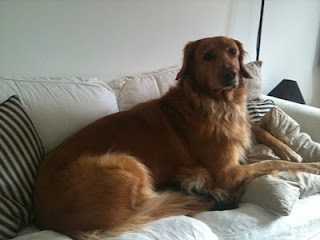 The story of Shiloh is about the spirit of a dog and the love of a rescue. Whoever it was that named her Shiloh - the place where Mozes took the Ark - couldn't have picked a better name. Already diagnosed with hip dysplasia at the young age of 1½ year, her chances for a fulfilling life seemed non-existing. Not for Shiloh. She defied all odds and made an unbelievable come-back. Fighting her way through the surgeries and rehabilitation programs without loosing her spirit and sweet character. Her special affectionate personality left intact. 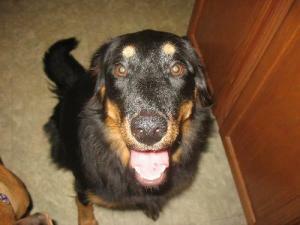 Today Shiloh is fully recovered from her ordeal and waiting for adoption. The rescue that took her in, project HALO, fought the battle together with Shiloh. Understaffed and under-financed, they did everything in their power to help Shiloh. It took them more than a year. They cared for her in foster, spreading the word and organizing fund raisers for the necessary surgeries and treatment. When the funds finally came available they helped her through two FHO surgeries, one for each hip, and the following long rehabilitation back to a life with proper use of both legs. Lets write a happy end to this story together. Spread the word. Retweet, like, and share Shiloh's story. And she will find a home. Yesterday's Pet Blogger Challenge turned out to be an awesome party. I made it to reading 55 blogs only to return to my own blog and finding 30+ comments of the same bloggers I was reading about. It was like you were all sitting in the room with me. What an energy. Could you feel it too? I am still shaking. And there is more, entries are still coming in! I don't want to dwell, but I cannot help myself wanting to have a "the day after" chat. It is that passion thing again. If I would have had a schedule my next blog post would already have been shining out there. But now you know me, so why hide? Thanks to all that participated. I found so much inspiration, advice and kind words. It has helped me tremendously to sort my own thoughts on how to "un-bully" this blog and how to move it forward. Key in it all was the schedule, suffocating the passion from which I write. I cannot point to one particular post, but all of you together convinced me to forget the schedule and continue to write from passion. And, important lesson learned 2, not mistake writing with the "publish" button. So the publishing is getting a schedule treatment. Not the writing, that will still come when it comes. Now we are talking schedule or not-scheduled, did you read the entries from two of the most professional bloggers around, Roxanne Hawn's Pet Blogger Challenge Q&A, and Kim Clune's Pet Blogger Challenge. Both successful and established writers, yet a total different approach. A perfect example that personality and background define how you write. There is no right or wrong. The right style is the one that fits you best. I am looking forward to next years Pet Blogger Challenge. Whats wrong with a yearly virtual group hug? Maybe we should call it mini-Blogpaws. Talking about Blogpaws, I would love to visit and meet all of you in real life. But as you know I take Viva and Kenzo with me everywhere, and having them on an intercontinental plain-trip is a nut I haven't cracked yet. Blogpaws Europe maybe? Does that exist? Nah, we would get lost in translation. A huge thank you to Edie from Will my dog hate me and Amy from Gopetfriendly.com for hosting and organizing this challenge. You guys just rock. This post is answering to the call of The Pet Blogger Challenge by Will my dog hate me Edie Jarolim and Go pet friendly Amy Burket. The challenge is to look back at what we've done with our blogs and forward to where we want to go with them, guided by 8 questions. A great opportunity to reflect and to have a peek in what other bloggers thoughts are. The challenge was born from a feeling Edie and Amy had their blogs where bullying them. Not my problem? On second thought, this blog was bullying me too! Kenzo and Viva agreed to allow me for this one time, not to write about them, and to show the blog it's place. Bullying me is their privilege. I am also going to brag a little, as Edie said that bragging is good. Just so you are warned in advance. Blog: "Get a plan, stupid"
A blog born out of passion for dogs. And in particular a passion for the Hovawart breed, nose work and tracking. It just had to come out. They say passion cannot be planned. A convenient dream for me as I am just not the "plan" type of person. But sure it can. I only needed a little push to actually start blogging. That push came in May of last year when my twitter pal Kim Garisson, @kimhalligan1, urged me to write a How To about tracking. The joy of my newly won plan-free blogging freedom soon faded. I realized that with my handicap of not being a trainer, behaviorist, vet, rescue volunteer, foster parent, author, or a native English speaker for that sake, left me with only one thing to do. Get a plan asap! Quickly scrambling a plan together I decided to - next to writing about Hovawarts and tracking - focus on stories based on Kenzo and Viva's experiences that touched some "higher" subject of importance. Stories like Are you prepared for a dog fight, Kenzo stopped visiting the dog park or Viva into BAT. I also made a schedule to blog regularly, resulting in a couple of book reviews to fill up spaces. Which turned out to be not one of my best sides, so I dropped the schedule. More about the schedule later. But at least I had a plan of what to write about, the core of any blog. Some events that enfolded in Denmark during the year, like the new Breed Specific Legislation (BSL), Cesar Milan's visit, the Danish puppy mill exporting to US, etc. were obviously out of scope for the blog. But I just had to speak out about them. As it turned out it was also interesting enough for my audience overseas to read what was going on in a different part of the world. That made me glad, as we can all learn from each other's solutions, as well as our mistakes. When Mary Haight from Dancing Dog Blog listed the puppy mill story in her top 10 for 2010, I was swept of my feet. I have Mary and her blog on a pedestal, and having her sign it off as "news worthy" is for me a tremendous compliment. They don't come better than that. 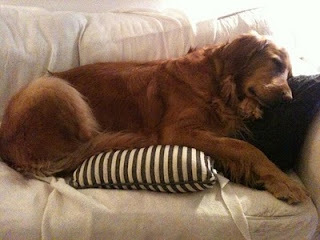 Deborah Flick from Boulder Dog blog was the first to mention us. She featured this blog in one of her Follow Friday recommendations as "versatile" and "international". What a terrific incentive was that! It also helped me to focus on what this blog was about and to stick with the plan. But most of all that recognition helped me to come over the block that my English is ... well, you probably already noticed. Blog: "Listen to your audience, stupid"
Some of the feedback I received during the year was from people that either started tracking, or expressed their thanks for the inside information about Hovawarts. Information they felt they couldn't find anywhere else. That was pretty awesome too. Some of the stories I wrote about Kenzo also touched a wider audience. I was so honored that the Small fearful dog therapist made it to the top 10 of 2010 from other bloggers like Little dogs on long leashes, Rescued insanity, Bark'n About and Dashing dachshund. How cool is that !? What I like best about blogging is the rush when you find out people are actually reading what you are writing. It is just so exciting to get a comment and find out what that person has got out of the story. It is different for everybody and enriching the story itself. It makes me see things differently. What worries me is when I stay empty handed for a couple of weeks and the blog remains silent. I know the right story can be around the corner. I rather wait instead of squeezing something in that not originates from the passion that started the blog. It would just be fake. Seeing most people return after such a silence, makes it worthwhile I like to think. Blog: "I told you so, stupid"
So actually this blog turned out not so Hovawart and tracking specific after all. But it is still the main mission. Coming to the plan part for this year ... makes it awfully quiet once more. I must admit I don't have one yet. Neither did I find a solution to the schedule problem. I you find me blogging regularly next year, then you will know I have untied that knot. Any suggestions are welcome. Actually I hope to find some inspiration with the other participants of the Pet Blogger Challenge. I am afraid the bullying blog is not joining for the ride. Kenzo and Viva will be proud. For me, I enjoyed bullying back. This can keep me going for the whole year. The Dog Whisperer supporting the message against shock- and prong collars. How did that came about ? Cesar Milan came to Denmark today, invited by the Danish national television. During the whole week up to the show the TV station couldn't keep a lit on their excitement about having this celebrity on their show. Commercials and teasers reminded us daily about this upcoming event, inviting people to take their dog and come meet the "Dog Whisperer". And not just any dog, dogs with issues please. But something changed during the week. A lot of people wrote to the TV station expressing their concerns. Not only conveying their second thoughts about the use of harsh methods like yours truly, but also about Cesar's earlier shows on National Geographic where shock collars, prong collars, etc. where used. As it happens, these collars are illegal in Denmark. The TV channel did it's research with a legal department working overtime, and changed the show at the last moment. No "Dog Whisperer magic" was shown and the whole thing was cut down into a 8 minute clip: After addressing the many concerns the station had received during the week, Cesar was interviewed about the use of shock- and prong collars. The host closed the interview by shortly stating - clearly directed to the viewers - that these type of collars are illegal in Denmark. Only one dog was invited in to meet Cesar for leash pulling issues. 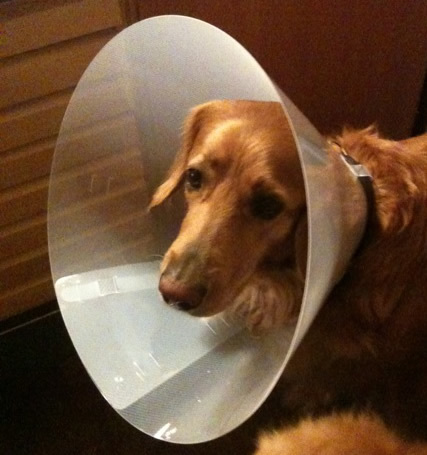 Cesar's session with the dog was not aired and the host only commented that "during the session we did not witness the use of harsh or illegal methods." Cesar's fans must have been really disappointed. No promotion of "dominance" and "pack leader" methods, but focus on the harm done by shock- and prong collars. What a wonderful outcome. You can find a video of the clip here: "Doglovers angry on "Good evening Denmark". Cesar is interviewed in English. Unfortunately the initial introduction and close is in Danish and not subtitled. The discussion still continues in Denmark. Most major newspapers wrote about the story and the sentiment is the same. One newspaper, B.T., made a clip with their interview of Cesar. Note how the press officer in the end breaks off the interview: Accused of animal abuse. 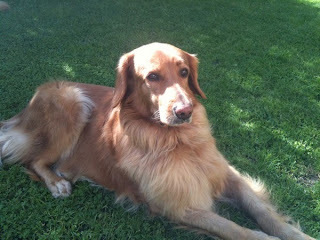 The Danish Kennel Club criticized Cesar's training methods "officialy" in one of their press release's on their website.